All systems require feedback to monitor and change behavior. Feedback usually compares current behavior with predetermined goals and gives back information describing the gap between actual and intended performance. Because humans themselves are complex systems, they require feedback from others to meet psychological and cognitive processing needs discussed earlier in this chapter. Feedback also increases human confidence. How much feedback is required is an individual characteristic. When users interface with machines, they still need feedback about how their work is progressing. As designers of user interfaces, systems analysts need to be aware of the human need for feedback and build it into the system. In addition to text messages, icons can often be used. For example, displaying an hourglass while the system is processing encourages the user to wait a while rather than repeatedly hitting keys to get a response. Feedback to the user from the system is necessary in seven distinct situations. Feedback that is ill timed or too plentiful is not helpful, because humans possess a limited capacity to process information. Web sites should display a status message or some other way of notifying the user that the site is responding and that input is either correct or in need of further information. Users need feedback to tell them that the input is in the correct form. For example, a user inputs a command, and the feedback states “READY” as the program progresses to a new point. A poor example of feedback that tells the user that input is in the correct form is the message “INPUT OK,” because that message takes extra space, is cryptic, and does nothing to encourage the input of more data. When placing an order on the Web or making a payment, a confirmation page often displays, requesting that the user review the information and click a button or image to confirm the order or payment. Feedback is necessary to warn users that input is not in the correct form. When data are incorrect, one way to inform the user is to generate a window that briefly describes the problem with the input and explains how the user can correct it, as shown in the figure below. Feedback informs the user that input was not in the correct form and lists options. Notice that the message concerning an error in inputting the subscription length is polite and concise but not cryptic, so that even inexperienced users will be able to understand it. 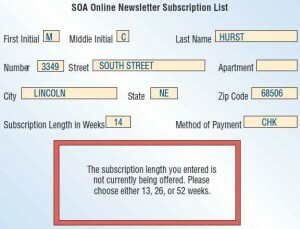 The subscription length for the online newsletter is entered incorrectly, but the feedback does not dwell on the user’s mistake. Rather, it offers options (13, 26, or 52 weeks) so that the error can be corrected easily. On a GUI screen, feedback is often in the form of a message box with an OK button on it. The analyst must decide whether to detect and report errors when a Submit button or link is clicked, called batch validation, or detect errors one at a time, such as when a user enters a month of 14 and leaves the field. The second method is a riskier approach since poor coding may put the browser into a loop, and the user will have to shut down the browser. So far, we have discussed visual feedback in text or iconic form, but many systems have audio feedback capabilities as well. When a user inputs data in the incorrect form, the system might beep instead of providing a window. But audio feedback alone is not descriptive, so it is not as helpful to users as onscreen instructions. Use audio feedback sparingly, perhaps to denote urgent situations. The same advice also applies to the design of Web sites, which may be viewed in an open office, where sounds carry and a coworker’s desktop speakers are within earshot of several other people. One of the most important kinds of feedback informs the user that there will be a delay in processing his or her request. Delays longer than 10 seconds or so require feedback so that the user knows the system is still working. 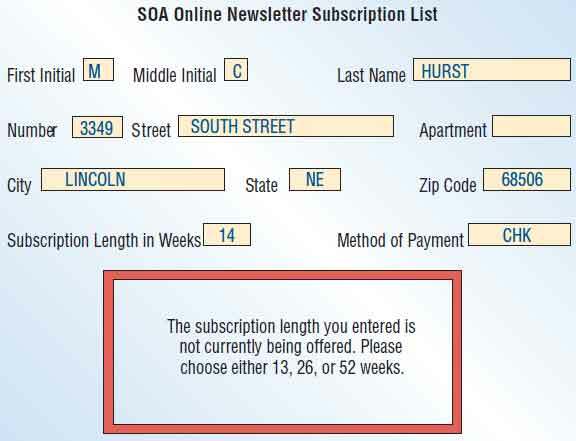 Figure below shows a display providing feedback in a window for a user who has just requested a printout of the electronic newsletter’s subscription list. The display shows a sentence reassuring the user that the request is being processed, as well as a sign in the upper right corner instructing the user to “WAIT” until the current command has been executed. The display also provides a way to stop the operation if necessary. 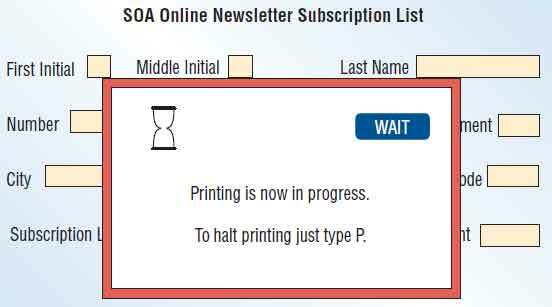 Feedback tells the user that there will be a delay during printing. Sometimes during delays, while new software is being installed, a short tutorial on the new application is run, which is meant to serve as a distraction rather than feedback about the installation. Often, a list of files that are being copied and a status bar are used to reassure the user that the system is functioning properly. Web browsers usually display the Web pages that are being loaded and the time remaining. It is critical to include feedback when using Ajax to update Web forms. Because a new Web page does not load, the user may not be aware that data are being retrieved from the server that will change the current Web page. 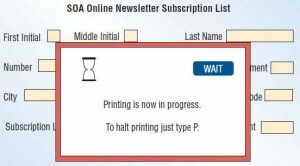 When a drop-down list is changing, a message, such as “Please wait while the list is being populated,” informs the user that the Web page is changing. Timing feedback of this sort is critical. Too slow a system response could cause the user to input commands that impede or disrupt processing. Feedback is also needed to let the user know that the computer is unable to complete a request. If the display reads “Unable to process request. Check request again,” the user can then go back and check to see if the request has been input correctly rather than continue to enter commands that cannot be executed. Users need to be reassured that more detailed feedback is available, and they should be shown how they can get it. Commands such as Assist, Instruct, Explain, and More may be employed. Or the user may type a question mark or click on an appropriate icon to get more feedback. Using the command Help as a way to obtain further information has been questioned, because users may feel helpless or caught in a trap from which they must escape. This convention is in use, and its familiarity to users may overcome this concern. When designing Web interfaces, hyperlinks can be embedded to allow the user to jump to the relevant help screens or to view more information. Hyperlinks are typically highlighted with underlining, italics, or a different color. Hyperlinks can be graphics, text, or icons. If used correctly, feedback can be a powerful reinforcer of users’ learning processes, serve to improve user performance with the system, increase motivation to produce, and improve the fit among the user, the task, and the technology. Feedback on personal computers has developed over the years. “Help” originally started as a response to the user who pressed a function key, such as F1; the GUI alternative is the pull-down help menu. This approach was cumbersome, because end users had to navigate through a table of contents or search via an index. Next came context-sensitive help. Users could simply click on the right mouse button, and topics or explanations about the current screen or area of the screen would be revealed. A third type of help on personal computers occurs when the user places the arrow over an icon and leaves it there for a couple of seconds. At this point, some programs pop up a balloon similar to those found in comic strips. This balloon explains a little bit about the icon function. The fourth type of help is a wizard, which asks the user a series of questions and then takes action accordingly. Wizards help users through complicated or unfamiliar processes such as setting up network connections or booking an airline seat online. Most users are familiar with wizards through creating a PowerPoint presentation or choosing a style for a word processing memo. Besides building help into an application, software manufacturers offer online help (either automated or personalized with live chat) or help lines (most customer service telephone lines are not toll free, however). Some COTS software manufacturers offer a fax-back system. A user can request a catalog of various help documents to be sent by fax, and then can order from the catalog by entering the item number with a touch-tone phone. Finally, users can seek and find support from other users through software forums. This type of support is, of course, unofficial, and the information thus obtained may be true, partially true, or misleading. The principles regarding the use of software forums are the same for those mentioned later on in Chapter “Quality Assurance and Implementation”, where folklore and recommendation systems are discussed. Approach any software fixes posted on bulletin boards, blogs, discussion groups, or chat rooms with wariness and skepticism. Besides informal help on software, vendor Web sites are extremely useful for updating drivers, viewers, and the software itself. Most online computer publications have some sort of “driver watch” or “bug report” that monitors the bulletin boards and Web sites for useful programs that can be downloaded. Programs will forage vendor Web sites for the latest updates, inform the user of them, assist with downloads, and actually upgrade user applications.